It’s perhaps unusual for a British comedy to open with the horrifying yet banal logistics of a state hanging. Yet, as with so many Ealing comedies, Robert Hamer’s Kind Hearts and Coronets has a streak of darkness and is easily one of the studio’s most morbid films. Based on the novel by Roy Horniman, the film plays fast and loose with murder as a whole family, famously realised solely by the performances of Alec Guinness, are despatched one by one by Dennis Price’s smooth talking killer, Louis D’Ascoyne Mazzini. 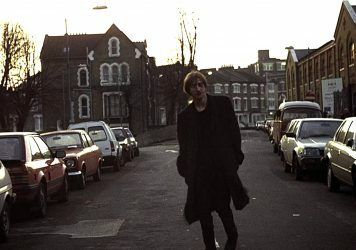 Hamer uses a typical Ealing blend of atmospheric studios and grounded real locations to capture a picture-postcard vision of suburban London and beyond. But the heart of the narrative is actually much further out of the capital and is ultimately a building important enough to consider worth killing a whole family for. The film follows the devilish life of Louis, a suave cad who is willing to commit parricide on the journey towards claiming an inheritance he has been denied. With his mother (Audrey Fildes) having eloped and married for love rather than position, her aristocratic family disowned her, forcing her to move from her extensive family castle, Chalfont, to the common suburbia of south London. Louis slowly works his way back into the family, intending to remove all of those ahead of him in line to the vast, historic property. But, with his love life intermingled with the woman he is forced to lodge with (Joan Greenwood) and the soon-to-be widow of one of the younger D’Ascoynes (Valerie Hobson), will he reach his goal without detection from the police? 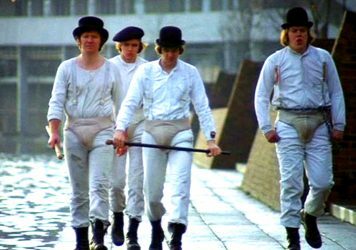 The houses of Hamer’s film are pivotal to the narrative and represent the social situations and positions that drive Louis onwards with his cunning, murderous plot. In fact, the locations and their differences are the very reason for Louis’ killing, something that is deeply ironic considering the likelihood of the modern rise in value of the London properties in particular. 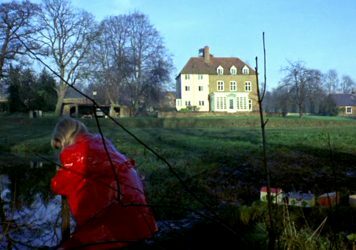 Chalfont itself is the goal of the film and is shown as an idyllic, Xanadu-like realm that Louis can only enter as a tourist on his first visit. He keeps a picture of it on the wall of his more humble abode, its backing adorned with a detailed family tree of everyone he must eliminate. He crosses each member out as he polishes them off one by one. In some ways, the family tree represents a map and a route to the castle which the character seeks to follow, the end being a position of power, money and even one of revenge taken in regards to the treatment of his mother. Chalfont Castle is actually Leeds Castle in Maidstone, Kent. A castle was built on the site in 1119 and was eventually the home ordained for Catherine of Aragon to live in by Henry VIII. 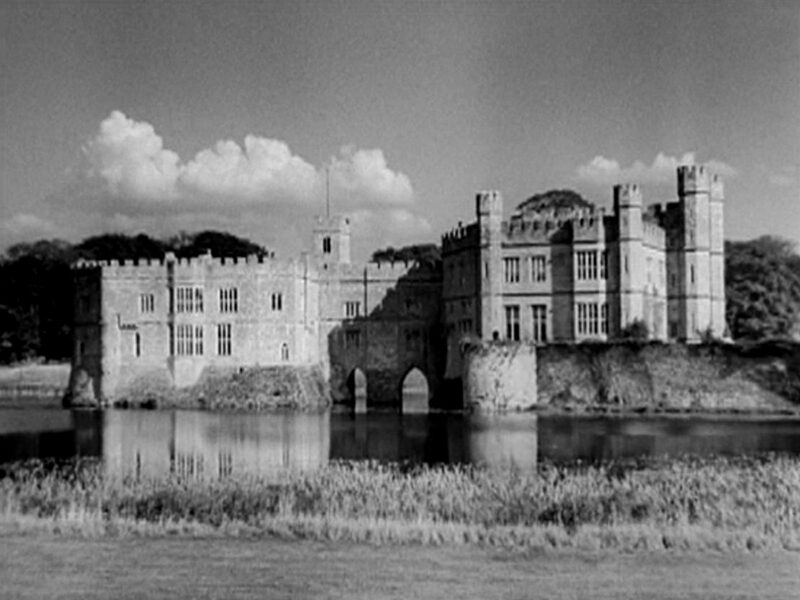 Due to being preserved by the private firm that now runs it, little has changed since it was seen variously in the film, though the castle was more frosty on my visit. I travelled to Hollingbourne from London and walked from the station to the castle through the winding Kent roads, themselves like something from an Ealing film. 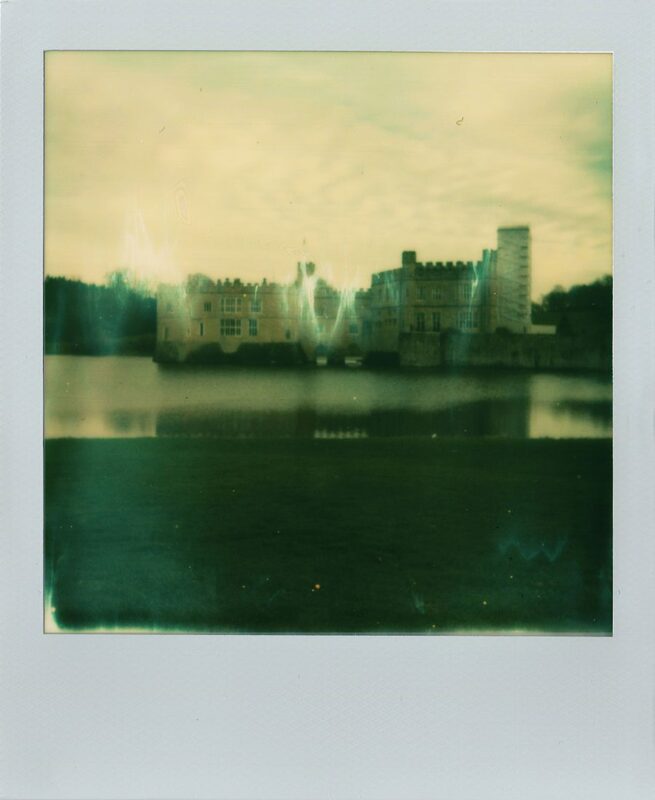 I wanted to shoot the photograph of today from the side of the castle as this is the view seen most often in the film and is the one which Louis keeps a picture of on his wall. The view is really his continued inspiration for carrying out the killings so carries a quietly powerful resonance. His final proper killing is also in the grounds of this location, trapping the penultimate Ascoyne D’Ascoyne in a man trap and shooting him in cold blood; the shock death then killing the last obstacle to his inheritance of everything the family deprived him of. After visiting the castle, I wanted to find out about the other houses that Louis finds himself in. Though Hamer makes great pains to set Louis’ first houses in Clapham, they are in fact nearer the studios of Ealing in Acton. The main townhouse that he eventually found himself living in as an adult has since been knocked down and replaced by an ugly new build. But the very first house of Louis’ mother still stands on Woodhurst Road. The road can be seen in the film at a bright time of the year, as Louis’ mother posts another failed begging letter to her family. Considering this is meant to be a place representative of a loss of status, it also reveals the level of class that the narrative is dealing with, the area being as nice a piece of London suburbia as can be. The strength of Ealing’s films lay in their balance of chocolate box British eccentricity and a more morbid form of drama, acknowledging both traits in our general national character. The studio’s films often do this by putting alluring yet evil characters in more typically romantic locations. Kind Hearts and Coronets is a perfect embodiment of this, where the leafy roads of suburbia and the historic castles of the Home Counties become the surprising backdrop for some quietly brutal and distinctly uncharacteristic violence. The true irony of the film is that all of this is happening due to a mother who “married for love instead of for rank or money or land” and because of a family who found such London suburbia ultimately distasteful in comparison to their vast castle.